The Westminster Bookstore is offering some good deals on G. K. Beale books. You can buy a 4-volume set consisting of Temple and the Church's Mission: Biblical Theology of the Dwelling Place of God, We Become What We Worship: A Biblical Theology of Idolatry, The Erosion of Inerrancy in Evangelicalism: Responding to New Challenges to Biblical Authority, A New Testament Biblical Theology: The Unfolding of the Old Testament in the New for $64 (52% off) here. And since this is over $49 you score free shipping as well. You can also order individual volumes at 40-50% off. Here are some options. 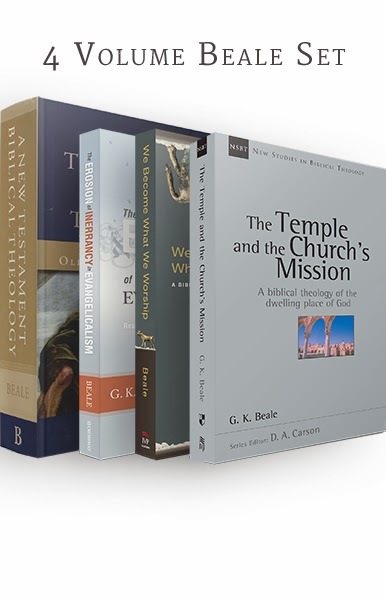 Temple and the Church's Mission: Biblical Theology of the Dwelling Place of God at $15 (50% 0ff) here. We Become What We Worship: A Biblical Theology of Idolatry at $13 (50% off) here. The Erosion of Inerrancy in Evangelicalism: Responding to New Challenges to Biblical Authority at $11 (50% off) here. A New Testament Biblical Theology at $30.24 (45% off) here. Commentary on the New Testament Use of the Old Testament (ed. with D. A. Carson) at $32.99 (45% off) here. Handbook on the New Testament Use of the Old Testament: Exegesis and Interpretation at $10.79 (40% off) here.